In Part 4 of the series marking the bicentenary of AWN Pugin's birth, we will look at what Pugin called the "True Principles of Pointed or Christian Architecture." This article comes from one section (with slides!) of the presentation given at the Texas Society of Architecture (AIA) Annual Convention with subtitle "From polemics to principles." Part 3 discussed polemics, and so now we must turn to the principles before considering applications and analytics. Pugin's writing has been unduly dismissed as a polemical argument for a style, not unlike many current arguments for the exclusivity of a style. But reading the texts, they are instead based on more fundamental principles which Pugin recognized (for his time and place) as most fully realized in the models of English Gothic parish churches. In the prospectus to the book True Principles of Pointed or Christian Architecture, Pugin proposed to outline six guiding principles to counter the architectural criticism that he saw as "little more than mere capricious opinion." Consistent with his gregarious style of discourse, he only clearly enumerated two. The following represents one enumeration of the six principles based on the themes repeated throughout the text. Pugin gives the first great rule of design, "there should be no features about a building which are not necessary for convenience, construction, or propriety." The statement is remarkable for its unremarkableness. There is not earth-shattering here, as it sounds very much like the basis of my own education late twentieth century architectural education. Nor was it in Pugin's time. As a tripartite criteria for architecture, Its archetype comes from the earliest treatise in Western architecture. The Vitruvian triad "firmitas, utilitas, venustas" is rendered as "construction, convenience, propriety." Propriety may sound to us a strange choice for beauty, but in the context of the elevated status of taste in the 19th century it makes sense. Propriety has come to be more associated with manners and conformity, but in this context it must be understood as an objective ideal and not a subjective preference. Beauty must retain its transcendental status, but absolute Beauty does not require absolute conformity to visual expression. Nor does the objectivity of Beauty negate conditional beautiful expressions. In Pugin's principles, propriety functions exactly to retain the objectivity of Beauty while seeking the form responding to all other concerns of architecture: function, climate, geography, culture, materiality, tectonics, etc. Adornment, or ornament, figures heavily in Pugin's True Principles, but it is by no means dominant. He addresses both its derivation and its execution. On derivation, he emphasizes that "all really beautiful forms in architecture are based on the soundest principles of utility," giving the examples of hinges, locks, bolts, nails, &c., which are always concealed in modern designs, were rendered in pointed architecture rich and beautiful decorations." Elsewhere he recommends following "principles that may be observed in vegetation" or otherwise natural. Artistic inventiveness is secondary, as on its own it leads to "fictitious effects." His attitude towards craft closely resembles that of Eric Gill, William Morris, Chesterbelloc, and other roughly contemporary British admirers of medieval society and economics, wherein the preference of integral crafts opposes the modern specialization and isolation of "artistic" endeavors as separate and privileged activites by special and privileged individuals. Pugin's interests in the medieval craft guilds and trades primarily addresses concerns more than the artistic quality of ornament. It extends to and entire culture and economy of production. He laments that the church no longer "cultivates the talents of her children to the advancement of religion and the welfare of their own souls;–for without such results talents are vain, and the greatest efforts of art sink to the level of an abomination." He dictates that ornaments should be made of materials acted upon in the character of the material. Pugin emphasizes that materials must not be "fictitious" or used "construction for effect." One of the greatest faults levied against contemporary architects throughout True Principles is the use of one material to imitate or replace another. The great dome of St Paul Cathedral, with its separate interior and exterior domes, receives this criticism, which Pugin bases on moral arguments: "Now the severity of Christian architecture is opposed to all deception. We should never make a building erected to God appear better than it really is by artificial means." He gives specific examples of offending materials as well. "Cast-iron is a deception; it is seldom or never left as iron. It is disguised by paint." Likewise "plaster, when used for any other purpose than coating walls, it is a mere modern deception, and the trade is not worthy of a distinction." Note that from this model, no particular material is excluded. Cast-iron is not itself an abomination by its nature, and plaster has a proper use for coating walls. The propriety of a material is based upon the honesty of its use. This allows us to extrapolate for newer construction methods and materials. To consider one example, reinforced concrete often receives popular outcry as being "brutal" or otherwise unsuited for churches. Such a view does not fit into the propriety of Pugin thus read. (I make no claim as to Pugin's hypothetical anachronistic taste for [list concrete churches here]). The principle applied to beton brut would first exclude using concrete to cast what should be carved (a column capital whose form derived from the activity of carving) or imprint a cast wall with the faux joint lines of a stone wall. These are against the nature of concrete. What that nature is, and what forms are appropriate to it, is harder to define, but that is because its nature is liquid and therefore its form indeterminate. But it is poured, not carved or stacked. Perhaps the propriety of concrete construction must be considered against the nature of the construction of its formwork. And no more larger, better, or more elaborate. Again, Pugin attacks extravagant falsehoods for show. He gives a criticism we might not expect from a proponent of the Gothic when he complains that "there is no repose, no solidity, no space left for hangings or simple panels: the whole is covered with trifling details, enormously expensive, and at the same time subversive of the good effect." One significant objection given to traditional church buildings is the relative increase in cost; or on the other hand, proponents of modern buildings cite cheaper construction as a benefit. Both of these assertions come from an atomistic view of architecture in which, for example, ornament is a cost-estimating line item which can be separated as a luxury. This argument is by no means new. Sir George Gilbert Scott lamented the "cheap church mania" around him. Pugin argued that "were the real principles of Gothic architecture restored, the present objection of its extreme costliness would cease to exist." Herein are two implications for our current church-builders. For those communities with considerable means, the challenge is to forgo "fictitious effect" and spending money on more elaborate individual features to have your names on them. For those communities with more limited means, the opportunity is to build honestly without the need to fake the idealized effect of a different kind of church. This is the most resonant with practice today, when sustainability and response to climate is arguably the principle discourse in architecture. Of course it is not something new, though it is often coupled with technology and progressive ideals. While the principle of propriety to climate and geography is not fully developed in the text, Pugin stated it was very important. Moreover, he repeatedly invokes it as a basis of everything from building form to materials to ornament. In the quote on the slide, he refers more to the implications of place on culture, similar to an conception of sustainability beyond design which includes things like food production and vernacular heritage. But Pugin also argued from a more pragmatic basis, claiming that classicism was inappropriate for England because the northern climate requires steep pitched roofs, which destroy the proportions of a portico. The first rule addresses convenience of the whole building. His emphasis on function is why many scholars characterize Pugin as proto-modern. He also had far-reaching influence on Victorian architecture and the English Arts & Crafts in particular, and therefore by directly to the Deutsche Werkbund (via Muthesius) and by extension the Bauhaus. For Pugin, function has a larger scope than the reductive modernist functionalism after the 1920s. His concept of function includes what he calls "symbolic functions," which makes what might otherwise be distinct ornament not only integral to the building's structure, but also integral to its use. Pugin's notion of function also extended to objects: "How many objects of ordinary use are rendered monstrous and ridiculous because the artist, instead of seeking the most convenient form, and then decorating it, has embodied some extravagance to conceal the real purpose for which the article has been made!" Furthermore, like the Ecclesiologists, Pugin sought to combine Gothic architecture with Gothic liturgical practice. The architecture was secondary, though as a project it might aid in restoring the culture and liturgy it once supported. The existence and arrangement of particular liturgical furnishings and artifacts, more than their adornment, is a primary source of propriety. By giving primacy to these objects necessary for worship, we too can cultivate substantive worship spaces without falling into the traps of artistic sentimentality unrelated to the building or of the vaguely meaningful chapels where space is equated to emotional spirituality, which dominate our more fashionable architectural publications. These six principles have no less validity than when they were written; each suggests significant faults I have recognized in our church buildings. Pugin's argument for the Gothic church was that it fulfilled all of these principles more than any other manner of building churches in England. It was styles, forms, and processes adapted to the climate, suited to the purpose and in continuity with the church. The question remains in how to apply these principles now. I purposely did not illustrate this section with images of buildings because that would repeat the error of reading this only as an argument for Gothic churches in England. So with the caveat in mind that the following examples do not limit the potential expression which might, with sufficient quality, satisfy Pugin's principles, here are three buildings chosen for contrast which I propose illustrate the principles. George Edmund Street was one of the leading architects in the generation following Pugin. 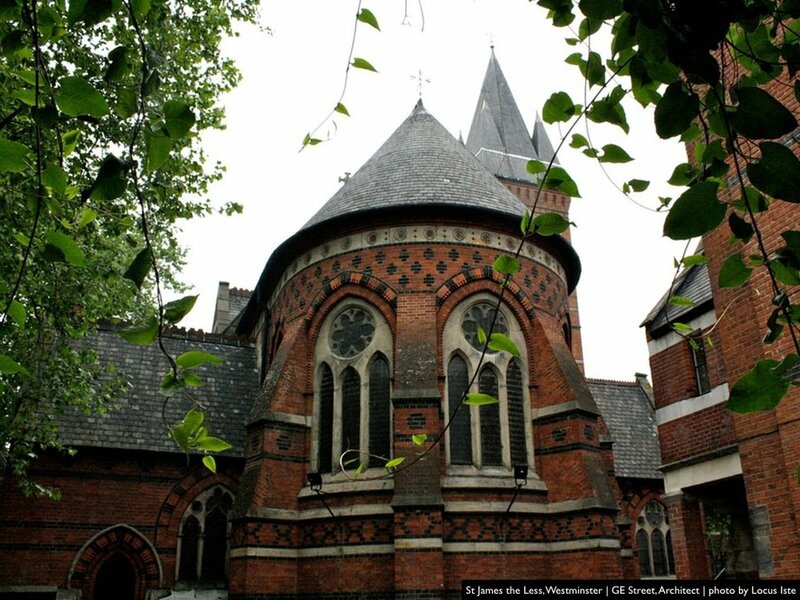 His brick churches, such as St James the Less in Westminster (also discussed in Part 2), are particularly inventive. Brick in this application allows ornament (pattern integral to the material fabric) to unify the whole building, interior and exterior. Pugin included brick in his discussion of masonry, and while it may have been a concession to cost, it is one well made as we can see here how it can be turned into an asset. In particular, consider the details of a unique ornamentation based on the nature of brick construction: modularity, material composition, inset stones. As an illustration of "Propriety of Materials" note that in the apse, the ribs are stone and the infill is brick, using each material for its preferred structural use. St James the Less also provides an example of balancing "Propriety to Expense" and "Propriety to Function." It was built to house an Anglo-catholic model of liturgy, so the chancel would be given preference of place. And all of the material and craft expenses has been concentrated there to accentuate the altar. St Bartholomew, Valley Center, designed by Kevin deFreitas Architects, is a parish church reconstructed after a devastating wild fires destroyed the old mission church on the Rincon Reservation in Southern California. Previously featured on Locus Iste (Mission Modern and Wooden Altars), it is one of the most read and appreciated buildings on the site. In reading True Principles from my generational perspective, the most unexpected resonance was found in the idea of propriety to geography and climate. In this church, a recognizable regional expression of climatic response coordinates to fulfillment of the remaining principles. “Ornament” obviously has a different meaning in this context; as the materials themselves and detailing become the ornament, they are necessarily derived from the essential construction of the building. Additionally, every object inserted into the essential construction are specific artifacts for liturgical function. Further evidence of "Propriety to Geography and Climate" exists in the exterior courtyard, including the materials used. The bell tower out front represents a direct figural reference to previous mission architecture. The rammed earth and thick masonry walls give a more subtle continuity with the native and mission tectonic traditions, as they all originate in the same response to climate. A final example adds the additional interest of having to respond to a Gothic-inspired Arts & Crafts college campus. This is the winning design for a campus chapel competition in 2009, which is soon to begin construction. It is worth noting that this is not how the architects talk about this project, describing principally its relationship with the landscape. 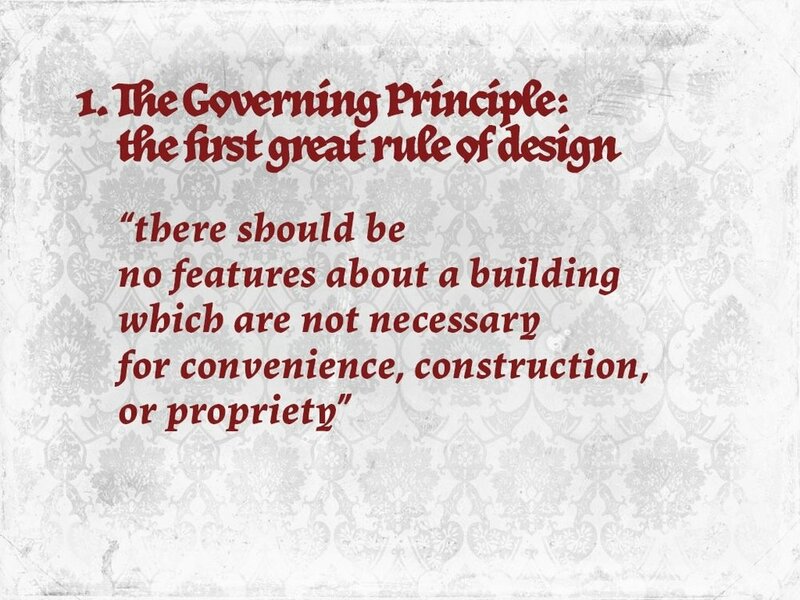 And yet because these principles are not tied to a style or particular design process, they can still be observed. The design has an abstract relationship to Gothic architecture. When adapting or abstracting, we need to find aspects of admired traditional buildings closer to the "essential construction" of the building than the individual features or objects. This project project takes the essence of formerly stone groin vaults and does not replicate, but translates into a form and scale appropriate to timber, using the planar forms of timber planks. The repetition of modular bays mediates the scale of a structure, an aspect which is a particularly valuable asset of the Gothic that tends to get lost in translation. The structure also incorporates a relatively recent liturgical arrangement, the communio raüm or an antiphonal ellipse. But even this new development is rooted in continuity with Gothic traditions as the monastic and collegiate churches were arranged antiphonally, with people facing the center axis on either side of the quire. What has changed since Pugin wrote True Principles is greater indeterminacy in form and everywhere a far more complex context against which to judge propriety. Pugin dealt with a national ecclesial tradition within the larger church with directly associated structures which had been vernacularly adapted to climate. But we now must build in Canada, for example, mosques whose forms developed in deserts. Cultural amalgamation reduces the ability for specificity to traditions. To what must a building be proper when the contexts themselves do not obviously correspond? These principles do not fully answer all of the problems of formal indeterminacy; however, in a guiding role in a design process, they will guarantee a degree of quality and honesty whatever the formal expression to which they are applied. And honesty and quality within any style is in far greater need now than arguing about which style is faked and poorly executed.